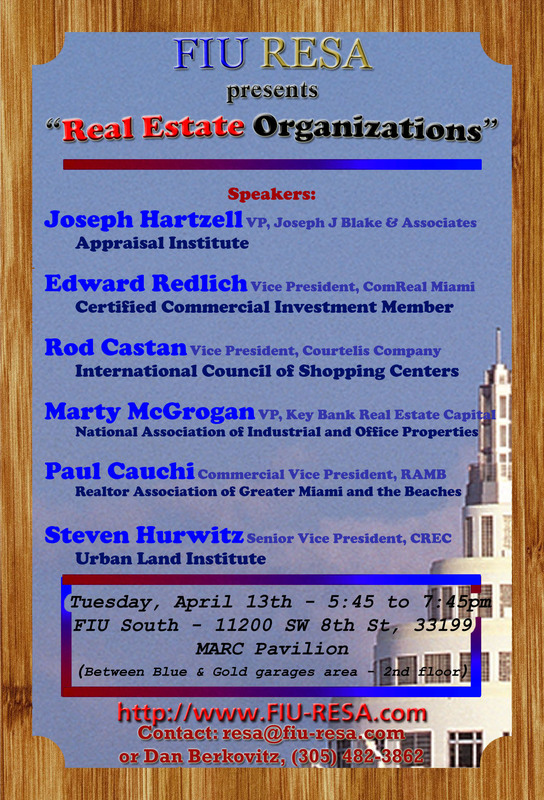 Join Ed Redlich and other leaders of Miami’s commercial real estate organizations on April 13th, 2010 at 7:45 PM at Florida International University’s main campus located at 11200 SW 8th Street, Miami, Florida 33199 in the MARC Pavilion. Hosted by FIU Real Estate Student Association (FIU RESA). Each speaker will present the commercial real estate organization in Miami that they have taken a leadership role in. The speakers are Ed Redlcih of CCIM Miami; Joseph Hartzell of Joseph Blake Associates; Rod Castran of International Council of Shopping Centers (ICSC); Marty McGrogan of National Association of Industrial and Office Properties (NAIOP); Paul Cauchi of Realtors Commercial Alliance (RCA); and Steven Hurwitz of Urban Land Institute (ULI).